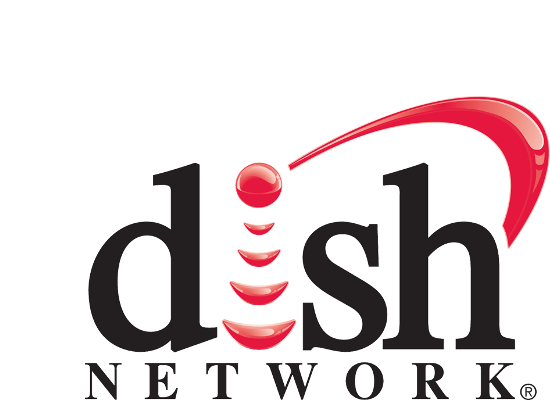 Set up and connect your DISH Network entertainment system. Connect your Hopper, Joeys and any other applicable devices to your home Wi‑Fi network. Once connected, you may use Harmony to control your DISH Network device and trigger Activities in which your device is included. 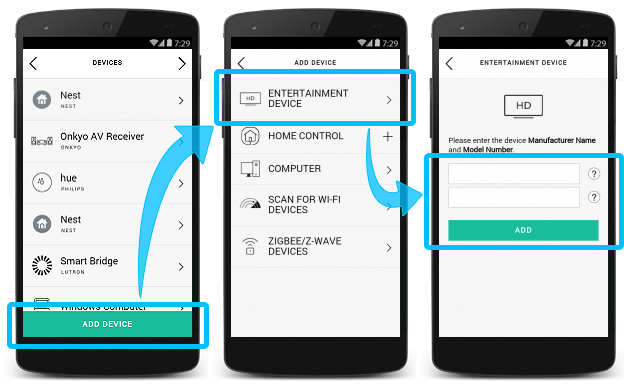 If you have multiple devices, select the receiver that you like Harmony to control. Enter the PIN code displayed on your TV to allow Harmony to control DISH Network. If you have multiple DISH Network devices, select the receiver that you'd like Harmony to control. Enter the PIN code displayed on your TV to allow Harmony to control your DISH Network devices. Once you've added your DISH Network devices, we recommend you create an Activity. Control icon lists commonly used DISH Network buttons. Harmony automatically imports your DISH Network control options. Commands specific to your Watch DISH Network Activity are also displayed for which you can add, remove or rename them. You can view common DISH Network commands on your phone or tablet screen. You can add, remove or rearrange these commands. Follow the instruction below to create a Netflix Activity. Tap ADD ACTIVITY and select Add your own Activity, choose a name and icon for this Activity and select your devices. Select your Hopper, TV and any other devices that are needed for this Activity. Select an Activity type, Harmony will power on all included devices, tap MY DEVICES ARE ON once complete. Finally, select your inputs, Harmony will ask if you are able to see and hear content from your device(s). If so, press YES. 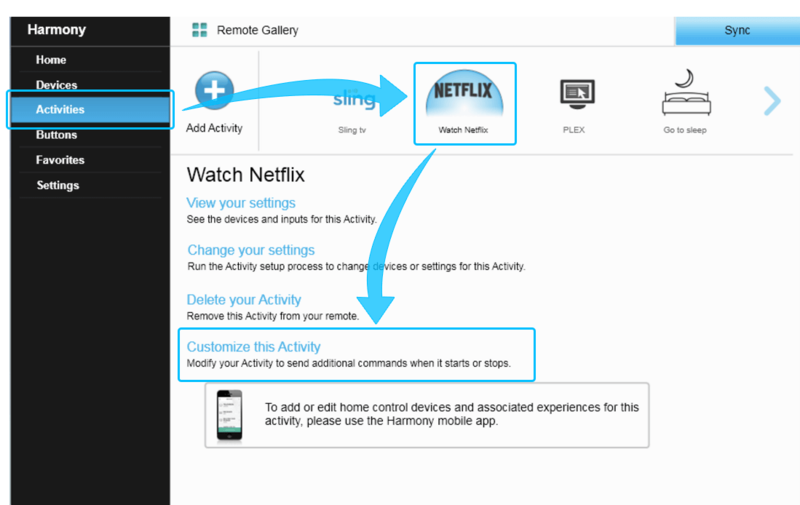 Once your Netflix Activity has been created, use the following steps to modify your Acitivity start sequence. Select your Watch Netflix Activity, followed by EDIT START SEQUENCE. Tap ADD A STEP, select DEVICE followed by Hopper DVR and enter 370. Select your Hopper, TV and any other devices that are needed as part of this Activity. 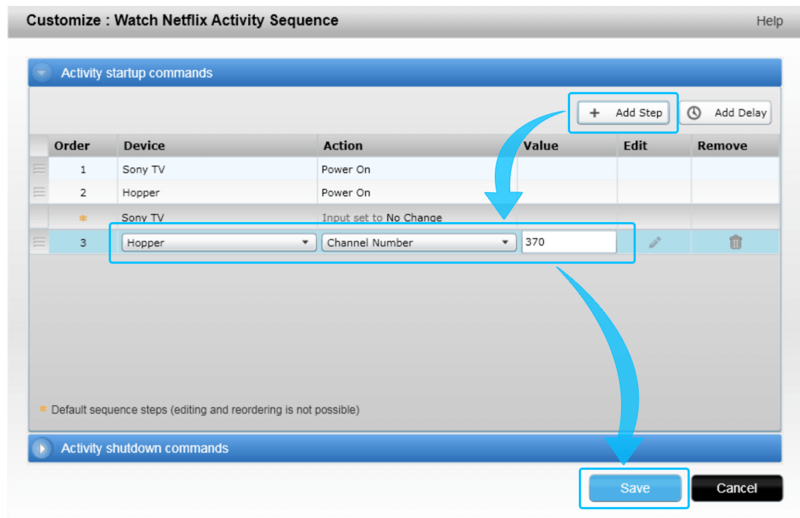 Select Hopper for your channel changing device, then secelct a device to control the volume. Select your TV icon and input devices, then click Done. Select the Activities tab on the left, followed by your Watch Netflix Activity. Select Customize this Activity and + Add Step, a new line item will appear. Select the Hopper and set the Channel Number to 370. 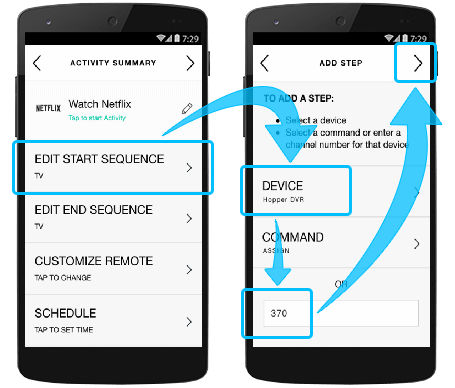 Click Save, remember to sync your remote after making any changes. If you your DISH is no longer controlled by harmony or you skipped the pairing process you can repair it using the steps below. Enter the PIN code displayed on your TV screen. The Wireless Joey has a technical range of 200 feet from the Hopper. For households wanting whole-home HD-DVR on four or more TVs, we suggest using a Super Joey or an extra Hopper. You can hook up to six TVs to the Hopper and Joey system by using two Hoppers and four Joeys. Your Harmony Express remote connects with your Alexa account, allowing you to control DISH. If you’ve been using another Alexa-enabled device to control DISH and have added the DISH Alexa skill, there may be voice commands that conflict with Harmony Express. If you’ve previously added the DISH Alexa skill and are having issues when sending commands, you can allow Harmony Express to control DISH instead. To do so, press and hold the OK button on your Harmony Express remote and say “Turn on DISH”. When using this method, subsequent commands will come exclusively from Harmony Express and will not use the DISH Alexa skill. Harmony hub‑based remotes connect to Hopper and Joey receivers through your Wi-Fi network; therefore, there's no need to place Harmony Hub near your Hopper or Joey setup, please ensure DISH Network is connected to the same Wi-Fi network as your Harmony hub. DISH Network may be controlled using infrared (IR) signals that are sent directly from your Harmony remote. Harmony Express remotes connect to Hopper and Joey receivers through your Wi-Fi network; therefore, there's no need to place Harmony blaster near your Hopper or Joey setup, please ensure DISH Network is connected to the same Wi-Fi network as your Harmony blaster.